Mrs. Hester's Classroom : Keep Me Sane! We as teachers have all kinds of tricks to keep ourselves sane and maximize time in our classes. I thought I'd share a few of mine with you today. 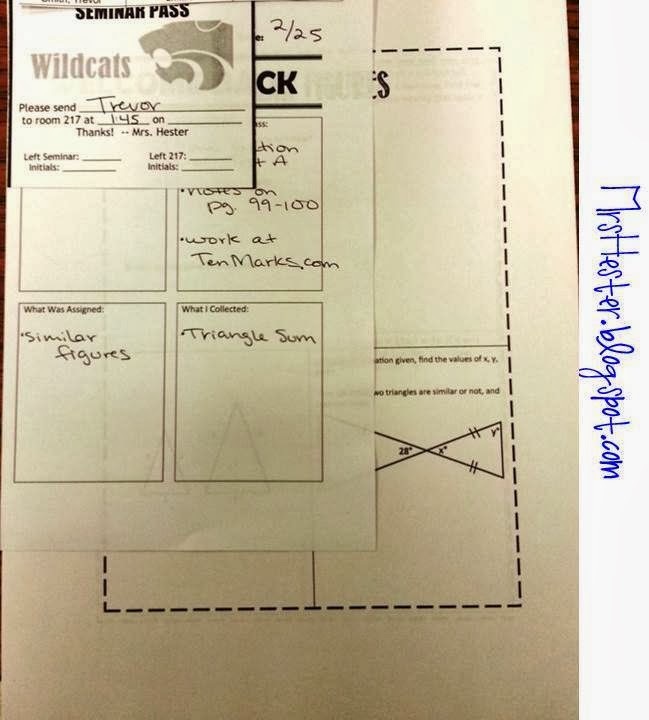 I know these are fairly common tricks among teachers, but here's my take on them. #1. I don't pass out anything out. Almost ever. As kids enter my room I always have my projector set to a "First Things First" list. 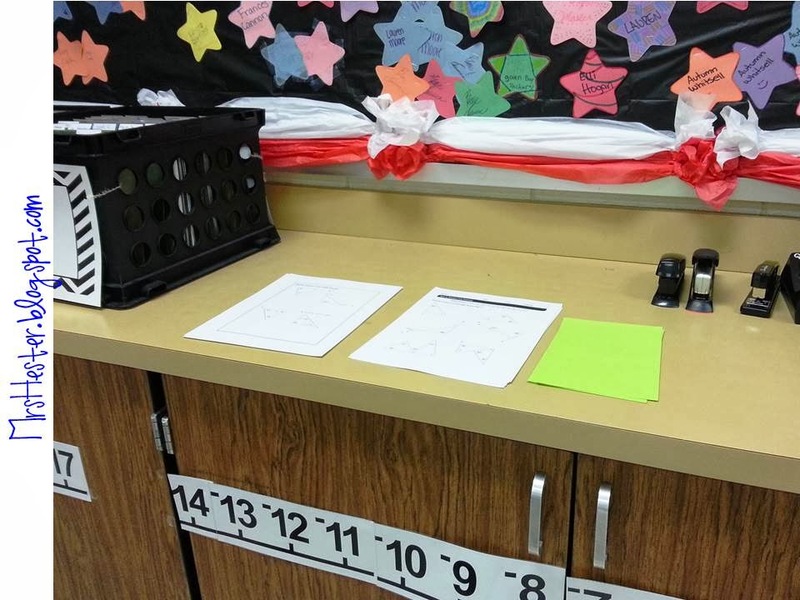 This tells them exactly what they need to pick up and do before the tardy bell rings. This usually includes things like ruler, 3 markers, scissors, papers from the counter, etc. #2. I don't pass out anything out. Almost ever. Sounds familiar?! Ha! Right next to their supplies area is their mailbox crates, as they have been named. My school has block scheduling so I teach three classes each day. These are my "b day" class numbers. If you spin the crates around 180 degrees the signs then read "2, 3, 4" for my "a day" classes. 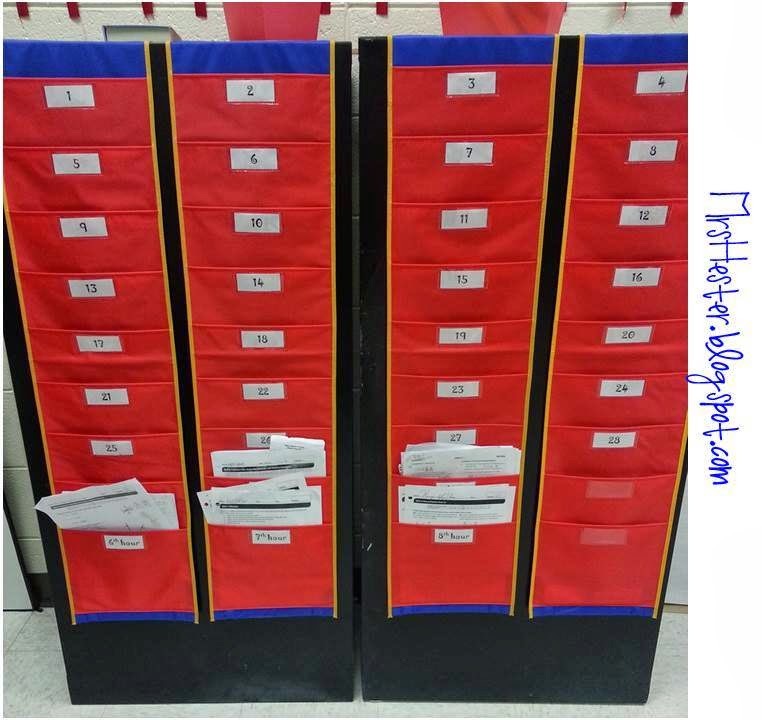 Every student has a hanging file with their name. After I have graded any work it goes in their file. It is their responsibility to check their files. Some students also store their INBs in their files if they don't need them that night. This is rare though. Whenever a student is absent I fill out one of these forms. I usually do this at the beginning of class while I take roll and students are working on their warm up. It is a wonderful little form! All the stuff for the day gets stapled to it, I often staple a seminar pass to it so students can come and get extra help on what they missed. The whole stapled package then goes in their files from #2. Here's an example from a recent absence. These are pockets like these and these that I ordered my first year of teaching. They have held up wonderfully!!! Including through four classroom moves. Mine are four separate organizers with nine pockets each. I have the pockets labeled #1-28, class periods for 2nd, 3rd, 4th, 6th, 7th, 8th, and then two empty pockets. My students are each assigned a number alphabetically and that's how they turn in all homework. You can see very slightly in the top right corner of the picture a piece of paper taped to the wall. This is a class list for each class with students' number, just in case they forget. When I tell students to turn in their work they walk over, put it in their pocket, and sit back down. I can instantly see who turned in their work and who didn't and *best part* it's alphabetized! I grab the papers out in order and I'm ready to go straight to my grade book. After my grade book, I head to the student mailboxes (#2) which are also in alphabetical order and quickly drop the work in the appropriate file. Easy! I just grab all the work for each class period. I then know which class period to go to grade book and which mailbox crate to head to. Yay for saving time! Great ideas. Thanks for sharing. I'm glad to see you blogging again. Love this idea. I'm drowning in paper. Just need a little clarification. Since there are only 28 slots for 4 classes, am I to assume you pull the work out after each class? Yes! I pull everything out between classes. It's very quick! Awesome idea! A few questions...do you assign homework nightly and if so do you have students do this every day? Lastly, do you grade homework for accuracy or for completion? Yes, homework is assigned almost nightly. The amount varies, but it is rare if students don't have something to complete. Yes, they do this daily. It becomes very routine and automatic for them. I grade homework for accuracy. Very rarely will I grade it for completion. I graded mostly for completion my first couple years but didn't feel like I was giving students good feedback. My personal opinion is if it's important enough for them to do and for me to take a grade on, I need to be assessing/providing feedback on what they're doing. Its sounds like a great idea. Have you had problems with students damaging or taking another students work? At the school I am currently teaching, I have had lots of issues with students not respecting other people's property including my personal property. Do you only collect the papers at the end of the day? How do you sort through the different class periods? 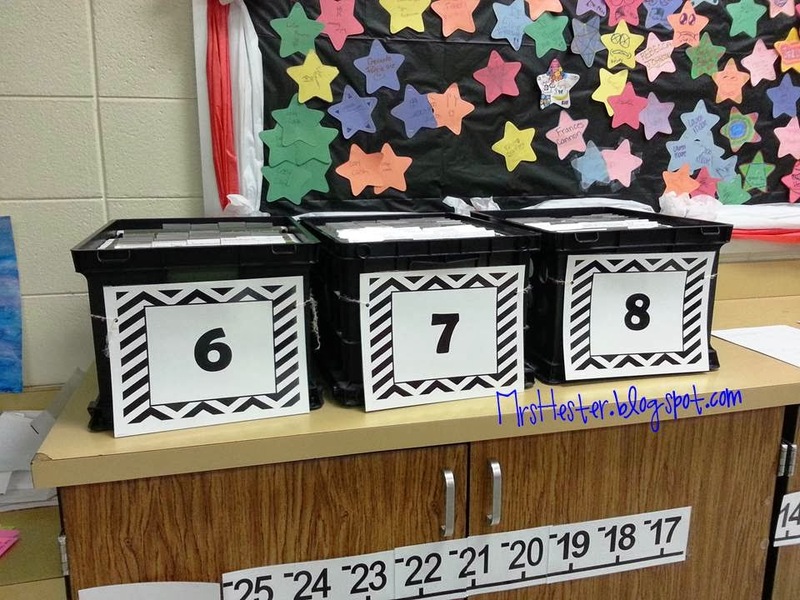 I also like your idea of using the crates as students' mailboxes. 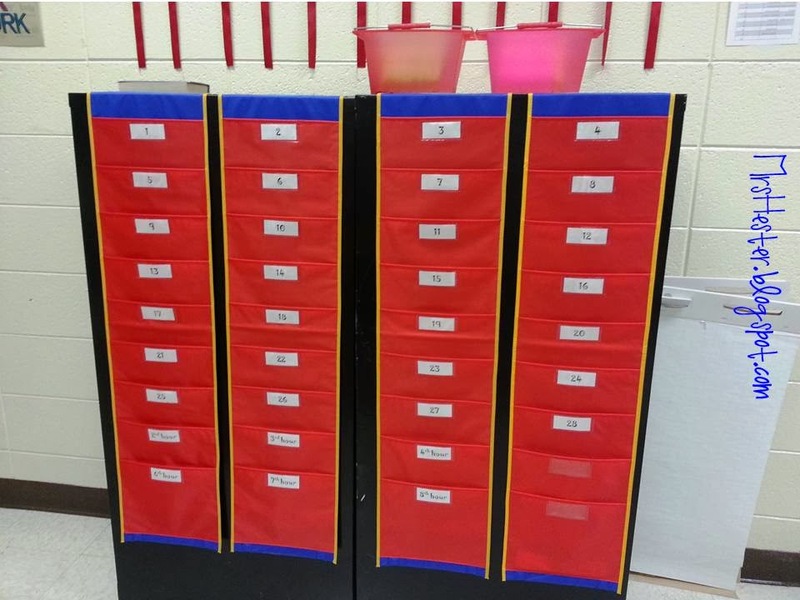 Do you have the students to "clean" out their mailboxes every so often? If so, how often? I like the idea of not taking up so much time passing papers out during class. I think that this will save time in class. I began every class period for the first few weeks with a list of reminders. ie: get supplies, check your crate, update your table of contents, etc. Now, as with most daily routines in any classroom, it's just habit. Sure, there are a few students that let their files get way too full and don't check them for a couple weeks - that's just life in junior high I figure. ha! It has saved me lots and lots of time not passing back papers. I love it!! I do have one more quick question. I noticed that you mentioned that you were on block scheduling. This is the first year that I have taught with block scheduling. I only my students for one semester. Is your block scheduling very similar? My block scheduling means that I see half of my students on M/W and the other half on T/Th. Then we run a "fast Friday" schedule and see all classes for about 50 minutes each. I do have my students all year though. Do you students only take math for 1/2 the year or do they go to another math course the other semester? I'd love to learn about your schedule! We only students for 1/2 the year. Once they pass and complete the course, they receive one FULL credit. I think I would like your schedule better because I would be able to go deeper into the content. I feel like I am rushed and barely cover topics enough to pass the EOC. I have had so much stud going on that I have been able to check my Bloglovin app. I teach 8th grade math and I am going to "block" classes this next year. I will have my students for 85 minutes every day all year long. I am nervous, but excited, about what to do with all that time since I have only taught 45 minute classes for 20 years. I am also implementing ISNs full force this year. I have only used them sporadically for the last 2 years. Any advice as how to use all my time and any other advice you may have would be greatly appreciated.